I decided I'd like to try to emulate this crunchy and nutty roasted corn salad when I fell in love with it at Fresh To Order Restaurant. When I made it the first time, I tried to keep it extra simple by using canned corn kernels...wasn't quite what I wanted. So, I roasted some corn on the cob in the oven (see my super-easy recipe below) and was much happier with the results! In addition, I decided the taste and color were better preserved by not tossing the salad with dressing or oil. (The little bit of oil applied to the corn before roasting is just enough oil for the salad.) Also, keeping the onions and seasonings to a minimum emphasized the flavor of the roasted corn. I know you'll find this salad absolutely delicious as I did! Because it's so filling, you really don't need very much as a side dish. The generous serving of nuts makes it wonderful and unusual (you could omit them if necessary). 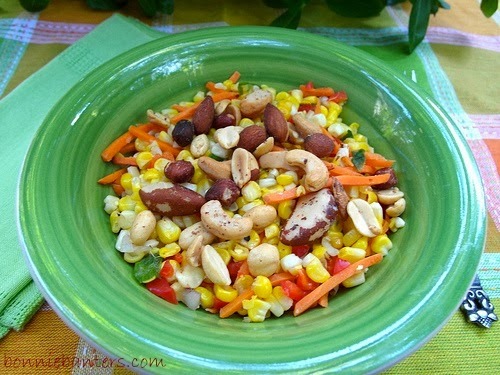 You'll Go Nuts for This Roasted Corn Salad! Cut the corn from the cobs and mix with all the other ingredients, except the nuts. (You can refrigerate this salad about a day ahead without the nuts.) Toss the nuts into the salad right before serving. Enjoy every crunchy bite! Well, this sweet girl (and her brother) have been keeping me busy lately...not as busy as her parents, of course! This photo was taken at two weeks. My precious granddaughter is now almost seven weeks old. As you can see, she's very prissy. She was 5 lbs., 13 oz. at birth; and now at almost seven weeks old, she weighs about 10 lbs! This girl didn't waste any time putting on the weight! She may be a redhead like...guess who? I know you love to eat darling, but you may have to wait a while for that corn salad! 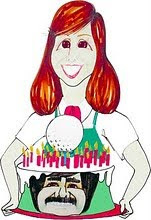 Thought I'd give you a laid-back recipe for Labor Day weekend! This is the butter I suggested you might want to try with my Morning Muffins with Bran and Raspberries which I recently posted. It is incredibly easy, yet adds just the right touch to your muffins, pancakes, waffles and toast; especially if you'd like to make weekend guests feel a little extra special. Raspberries, strawberries, blackberries or blueberries should all work well in this recipe. 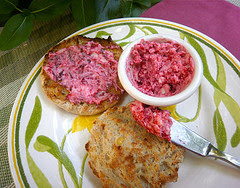 Shown in the photo is raspberry butter on an English muffin. *Tip: Fresh or frozen berries are fine (except frozen blueberries). 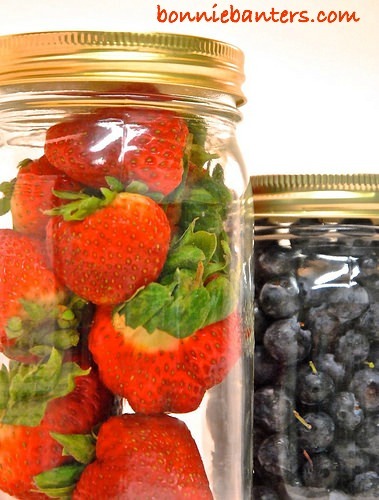 If you use frozen berries, let them come to room temperature before adding to the recipe to avoid clumping. I don't use frozen blueberries in most recipes because I feel they lose their flavor when frozen. Spread a little extra love with this very berry butter and enjoy!